Topdressing is a fine blend of sandy loam, compost and aged bark fines used for topdressing lawns and amending existinggardens. When spreading on your lawn, a depth between 1/4″ to 1/2″ should be used. When you first plant grass you can start with the best screened topsoil but once the grass is established, topdressing is the only way to properly replenish the lawn’s soil. Fertilizing will add nutrients to the existing soil; however it cannot replace the mixture of sandy soil and composted organic material that has been depleted. 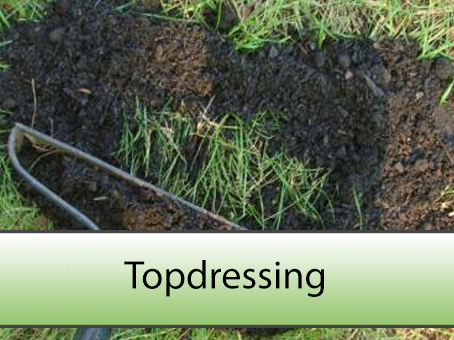 Topdressing is the process of adding a fine layer of fresh soil to the lawn surface. Top dressing benefits the lawn as it builds up the quality of the soil over a period of time. Another benefit of top dressing the lawn is that it will help to even out any lumps and bumps that are present on an uneven lawn, filling in any small hollows that may develop. Top dressing also stimulates the grass to produce new shoots and so results in denser grass cover, which helps combat the onset of weed and moss infestation. The key to applying the top dressing is to make sure that you get a thin, even spread of the top dressing over the area and to make sure that the top dressing does not remain ‘on top’ of the grass blades. The top dressing should penetrate down to soil level. Before you begin you may find that on heavy or compacted soils, aerating a few days before will help your topdressing application. You then spread the top dressing over the required area using a flat surface such as the back side of a rake. Make sure that the spreading action leaves no bumps on the surface and fills all the hollows in. Do not leave top dressing lying on the surface of the lawn. You can use a garden rake or a stiff bristled broom to work the Top Dressing down into the blades of grass. You should topdress the lawn in spring or autumn, because grass seed germinates when the temperature is approximately 15ºC – 20ºC. Lawns which are based on poor quality soil will benefit from top dressing the soil each year. Lawns based on good quality soil should not need top dressing every year, although if you want a really top class lawn then you may wish to do so!